The Royal Parks Half Marathon has a very special place in my racing calendar. I first ran this splendid event in 2016 as a 1:45 pacer, and was fortunate enough to obtain a ballot place in 2017. I was pretty unwell last year, but vowed to complete the race, doing so in a pretty disappointing time of 1:39. As a result, I really felt that I had unfinished business with this race. As luck would have it, I managed to obtain yet another ballot place for 2018! 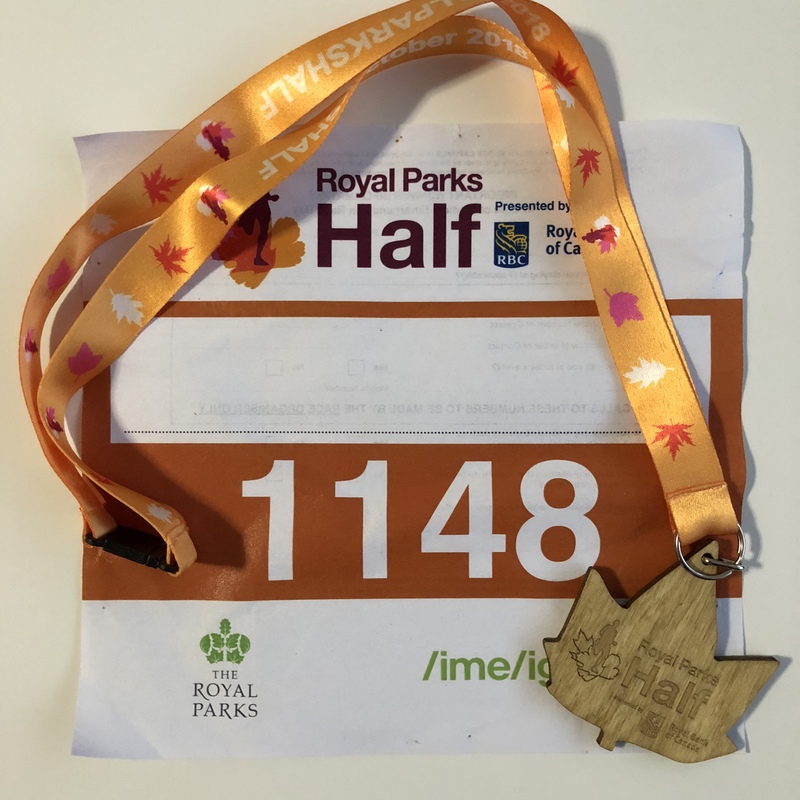 I had a rough start to the year, but managed to get things under control and got my running back to some normality by July, running a 5k in sub-18 and 10k in sub-38 later in the summer. Longer distances were/are still not up to scratch, and although my race times for shorter distances are back to normal, my legs aren’t feeling great running past 12k. I knew a PB was not on the cards (<1:23) so decided that I would go out and run at <1:30 pace and see how long the legs could hold-up for. I took the 7:30am train from Woodford and arrived at Knightsbridge at around 8:25am. Just before we got out from the station we could see that it was absolutely pouring down! I got out my brolly, and Sania and I began to walk to Hyde Park. Sania asked me if I still wanted to run. It’s not about being a quitter, but practicality and sensibility in my case- being on 3 types of immunosuppressants, catching a ‘cold’ could lead to a big UC flare-up. But I was insistent that I’d be okay having come this far since last year. I tried to engage in a warm-up, but the park was so crowded this was neigh impossible, and I only managed 400m of shuffling between people. I made my way into the start funnel shortly before 9am, just as it started to rain down again, and managed to get closer to the front. We started promptly at 9am- here is how the race went. Kilometre 1: I felt absolutely great! The legs were springy, and the pace felt a lot slower than it was. I saw my pace was ~3:48/km which was quite a bit faster than the sub 1:30 goal pace I had in mind. Even though I felt strong, I obviously didn’t want to blow my engine later, so dropped the pace down. 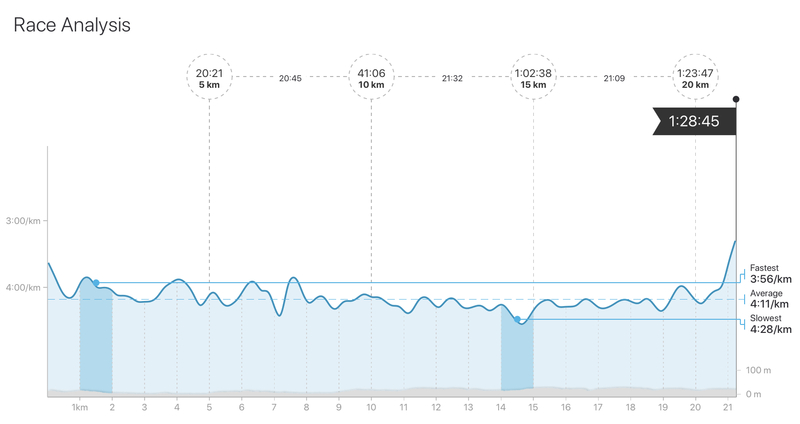 Kilometres 2-4: My quads started to feel a little tight, and I knew that this was due to a poor warm-up. I started to feel concerned that they may cramp-up later, so after the first water station on Whitehall (just before the 5k mark), I pulled over and had a quick stretch. By this point it was raining hard again. Kilometres 5-7: I felt pretty good for this part, even though it was raining down now. I saw Jamie Xavier give me a shout-out around here as well which lifted my spirits. Kilometres 7-8: I once again had to pull over at around the 7k point, and have a quick stretch out again. Not ideal, but this could have saved me some agony later. I passed the 5 mile water station located on The Mall and felt good. Kilometres 8-10: Running up Constitutional Hill and knowing I would be soon entering Hyde Park. There is a very slight incline here, but I felt okay. Kilometres 10-12: I entered Hyde Park and was greeted by the cheers of spectators. This is where Royal Parks truly shines, in the second half! I felt a bit of planter fasciitis on my left foot at this point, but from experience knew that it may go away. The next kilometre was spent with a slight modification to my gait to accommodate this, and fortunately, this passed. Kilometres 12-16: These miles did not feel great, but the crowd support really helped. I felt okay, but the legs just started to feel a little heavy. Kilometre 16: I checked my watch and saw that I was still on for a sub 1:30, with a slight cushion. Okay, just one more parkrun to go, I thought! Kilometres 16-18: When I got going in Kensington Gardens, Tim (a fellow ELR) crept on up me and said hello. I had not met Tim before and it was a pleasure to have a quick chat and run together for a bit. Kilometres 19-20: My legs felt okay, and I knew by this point that I could pick up the pace a little, which I did. Cardio felt absolutely fine. I was at a very conversational pace, and things felt rather ‘easy’. It was purely my legs which I was concerned about, having not done many long runs. Kilometre 20: I knew that I was home-free now. I really enjoyed running down the final stretch of South Carriage Drive. I could almost visualise the juxtaposition from last year, when I was limping at this point. Kilometre 21: I powered through and gave a strong finish with 200m to go. It felt great to cross the finish line, and I saw the time on my watch/the board was well under 1:30 (1:28:45 chip time). Job done! So this wasn’t my best HM for a time. My PB is 1:23:14, but this is still my quickest half in >3 years. Albeit I have only run 3 HM races since then, none of which I’ve done any preparation for. I then went and collected some goodies before meeting Sania. 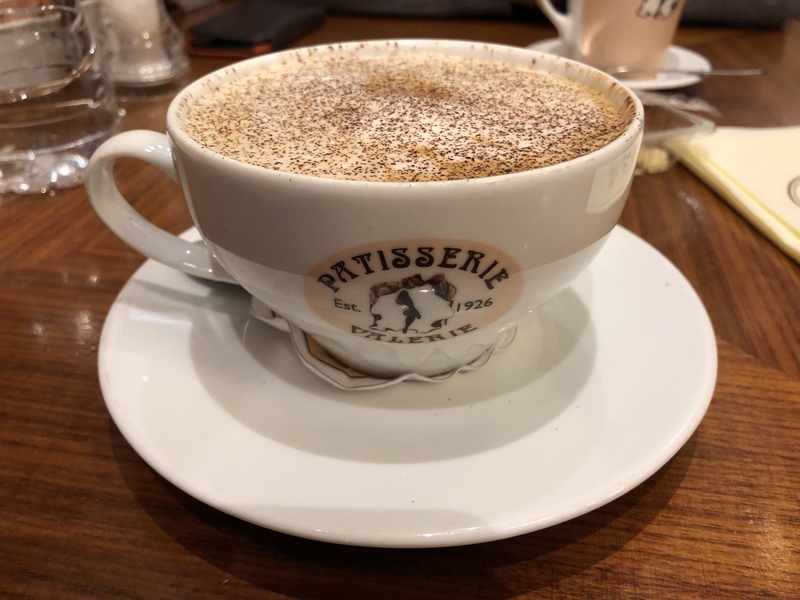 I changed into some dry clothes and we then walked to Patisserie Valerie in Knightsbridge for some well deserved coffee/brunch, along with a quick trip to check out the Christmas store at Harrods before heading home.